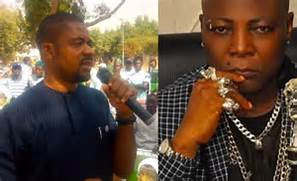 Adeyanju on Wednesday revealed that Charlyboy confessed to him that he collected money form President Muhammadu Buhari to attack Atiku before the presidential election. Festus came here after we talked about your problem, I asked Festus, do you believe in what I’m doing, he said yes. So I told him because you don go follow these people, you no go fit support me? This explains his arguable obvious silence throughout this election. Hmmm, everybody has got a price. If na yoruba now una go dey shout traitor, betrayal yen yen yen. Reason he sang another guyman, na him be proper guyman. But this audio does not prove anything na, where did Area Fada admit that he took money? Charly fucked up for collecting money big time.. I was more than shocked..
Choiii so our mumu just enter next level? HAHAHAHAH your mumu never do if believe both PDP and APC are all riggers. Your mumu still never do if believe DEji too doesn't have a price. Ask him how much he collected for PDP and SARAKI? Deji went to prison for the same somebody..
Why is integrity such a big deal? The fall and rise of Area Fada. lol! Charlie mumu never do. He was shouting Our mumu don do. The minute he receive d money he changed mouth. Gbam at old time crook. This was exactly how APC rigged the election too,so dissapointed in Charley boy,later he will be shouting our mumu don do. Una never see nothing yet. More will come... Aunty Oby, that Yesufu woman, Deji, Sega and all of them who claim Human rights activists are all job men. Na how them ration money go still cause yawa and expose dem. One of the true test of integrity is its blunt refusal to be compromised. The reason there can never be a revolution in this country. I am not only disappointed in Charlyoldboy but Keya amu. How did somebody who was Gani Fawehinmi brought up descend so low to giving bribes and joining forces with corruption? Money can indeed change some brutes called men. Hmmmmmmm nigerias and money, charlyboy you messed up now Baba will be looking at you with side eye. But where in the audio did he admit collecting money.if he collected would he go about telling people as claimed by Deji that he told lots of people. Nnamdi Kanu was also paid to disenfranchise the igbos. He was very successful as few people voted in the east. But some average igbos still worship him. Nigerians are always quick to conclude. I despise sahara reporters with a passion. I hate their kind of journalism. Earlier u were fighting with MFM now its Charly Boy. Was Charly Boy aware that he was being recorded? Is Charly Boy or MFM the problem with Nigeria? I hate this kind of negative journalism. I will always respect Charly Boy at least he does not pretend. Can Sahara reporters and this 'activist' say they have not collected money from sponsors?